Most Americans have credit card debt. Of course, how much they have depends on their spending habits. At one time or another, however, most are trying to pay off that debt. You have three main choices to pay down your debt: extreme budgeting, using a credit consolidation service or declaring bankruptcy. The final choice, declaring bankruptcy, has a severe, long-lasting impact on your credit score. Seek legal advice before declaring bankruptcy. Extreme budgeting requires first determining the amount of money you owe. Next, identify how much you are required to pay each month as a minimum payment for all of your debt. Third, subtract that amount from your monthly income. Fourth, subtract the amount of your living expenses from the remaining income. The result is the amount of flexible spending money you have each month, and the maximum amount of money you can dedicate to paying off your debt. You will likely need to develop a budget to ensure that you contribute to pay the maximum amount you can while meeting your other financial obligations. CCC is a service, usually offered by non-profit agencies, to consumers who are unable to pay off their debt on their own. The company negotiates on the consumer's behalf to consolidate and then reduce the total amount of debt owed. Subsequently, you make a single payment toward your debt, usually each month. This amount is credited toward your consolidated debt. Credit card debt consists not only of the balance on your card, meaning the amount of money you've spent, but also the interest, fees and other charges the credit lending institution charges on that debt. The largest charge most companies levy on a balance is the annual percentage rate. This rate varies depending on the card agreement, but can be as high as around 29 percent. Each month the company multiples any balance on your card against your percentage rate. The calculation's result is then added to your balance. Interest is compounded, meaning that each month the credit card company takes your entire balance, including the amount of any interest it charged you the previous amount, and calculates your new interest charges. This can result in you paying significantly more money than the amount of your original purchases. A company may charge a different, usually higher, interest rate on any cash advances you take. The amount of any cash advances you obtain over the month is multiplied by the applicable interest rate and you are then responsible for paying the entire amount. Some interest rates vary. This means that they will change depending on a specific aspect of the credit contract. If you opened the card with a promotional interest rate, your interest rate rises after you have the card for a period of time, such as six months or a year. The credit company may also increase your interest rate if you miss a payment. Other types of fees include annual card use fees, overdue or bounced check payment fees and other charges. Their types and amounts depend on your card's contract. The term "credit card debt" is not synonymous with "consumer debt". Rather, the former is a portion of the latter, and the latter includes other types of debt. Credit card debt is just that: amounts of money owed due to the use of credit cards. It accrues due to the purchase of goods or services. 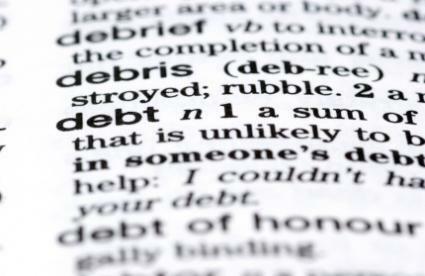 Consumer debt, on the other hand, refers to the entire amount of debt you owe, regardless of type. This means that it includes mortgages, student loans and other types of debt. While staying out of debt may be hard, it is not impossible. Debt expert Dave Ramsey suggests closing any credit accounts you no longer use. This will prevent you from becoming tempted and using more credit than you can pay for. Keep in mind that closing accounts may temporarily lower your credit score since a portion of your credit score is based on your available credit, but if your main objective is to stay out of credit card debt, closing the accounts is a step in the right direction.